You may think you are confident now, but what about if you are lost in a foreign city by yourself and don’t speak the language? While studying abroad, you will face so many situations where you are lost and have no idea where to go or what to do. There is going to come a point when you realize you just have to take a deep breath, ask for some directions, and trust yourself. You are smarter than you think, be confident. We all learned in elementary school that it is wrong to judge people, in any way, shape, or form. Sometimes though, we make assumptions and we do it without realizing it. Maybe it’s living outside your comfort zone, and the fact that you are all stuck together, but all the mistakes and memories made along the way bond you with people you never thought you would. In turn, you make the friends of a lifetime, sometimes even friends from different states, or even countries. 3. It’s a big world. Most of us are raised to go to college, get a job, and get married. Basically, we are raised to achieve the “American Dream.” When you are abroad, you realize there is a lot more to life than the status quo and there are so many other paths to take. “People tend to follow what their parents or friends tell them, like in politics, religion, etc. 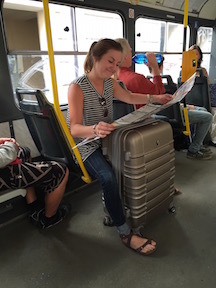 I think when you travel, your mind is opened up to so much more because of all the different cultures,” said Meredith Johnson, Auburn student who lived in Germany for a year. 5. Mistakes happen…live in the moment. Sometimes plans get changed or things don’t go your way. Sometimes you spend way to much money shopping or downtown. Sometimes you just mess up. From my own experience, I have made plenty of mistakes in about every category you can think of…I’m talking bad. In the end though, life goes on. Whatever happened now won’t be a big deal a year from now. It really could always be worse.